Blighty's Britfood Tips: Please Sir, Can I Have Some More? I have a fondness for eating porridge for breakfast. It all started when I was diagnosed as a mild type 2 diabetic. Oatmeal is a good source of starch which the body can convert slowly into blood glucose. My wife, who doesn't like porridge, calls it "gruel". While reading through a book of Celtic recipes recently, I came across a recipe for Scottish Gruel. "Why", I thought, "did gruel get such a bad reputation?" Charles Dickens portrayed it as a very lowly meal for workhouse boys in his novel Oliver Twist. But gruel doesn't have to be a bland, tasteless meal for boys living in poverty. I thought I could improve on Dickensian gruel. I succeeded. 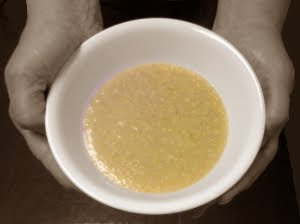 I created a gruel that would have had boys lining up to get into the workhouse - and asking for more! I offered my wife (who doesn't like porridge, remember) a small bowl of Blighty's Britfood Gruel. She liked it - and asked for more! Cast aside your prejudices about gruel and give this recipe a try. My wife and I decided it was a very pleasant tasting and nutritious light meal. We tried adding a little cream to it. My wife thought it was even better with cream, but I preferred it without. You can experiment with different flavourings if you wish. What about strawberry gruel, vanilla gruel, or banana gruel? Oliver Twist would have liked living in my workhouse.